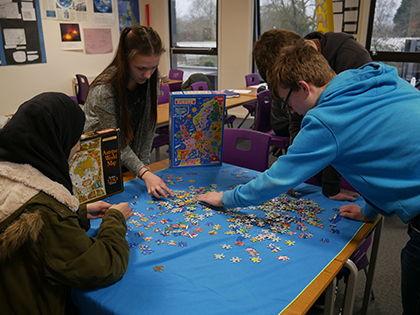 A new Cartographical Society has set up at The Sixth Form College, Solihull to give students an appreciation of a world without walls! Year 12 students with an interest in Geography, Geology, Environmental issues, International Relations, Hazard Management and Anthropology were invited to join. As well as providing some fun and real interest in cartography, becoming an active participant will also benefit students with related university applications, giving them something unusual to write in their personal statements or talk about at interview. Students are also being encouraged to think about whether their interest might extend to a topic for an Extended Project (EPQ). Meetings every Wednesday afternoon give students the opportunity to examine various maps and consider their origins and meaning. The first map that students looked at was William Smith’s 1815 map of the Geology of England and Wales, commonly known as “The Map that Changed the World”. In week two, students examined the work of Phyllis Pearsall, who walked 3,000 miles to check the names of the 23,000 streets of London, working 18-hour days that started at 5.00am every day. Her work led to the creation of the A-Z maps.